— This article by Jerry Cates and Dana T., first published in May 2009, was last revised on 24 April 2016. © Bugsinthenews Vol. 10:05. Dana wrote: “Jerry — I originally found your website several weeks ago, while trying to find out, on the Internet, how best to keep rat snakes out of my yard. We live in an established subdivision, but our home backs up to a wilderness area. it is very common for rabbits, opossums, raccoons, and–yes–snakes, to come into our yard. We love most of the wildlife, but we are less happy about having snakes in our landscaping and on the porch. Dana had sent photos of a Texas rat snake she found in her back yard several weeks back. We discussed the alternatives that she could try to keep snakes out of her yard, and I suggested she study the posting regarding snake exclusion, along with the discussion on snake repellents. By following those suggestions, she would probably not be seeing too many snakes around. And–Oh, well–a rat snake, every once in a while, was nothing to worry about anyway. Ideally, following the advice on the two pages linked to in the previous paragraph will produce a reasonably snake-free environment. But there are no guarantees, especially when Mother Nature gets involved. The advice I give people like Dana about snake exclusion and snake repellents isn’t magical. It is possible to carry out all the suggestions on those pages, and still have snakes show up where they are not wanted. Of course, if that snake is venomous and someone gets too close or steps on it, they will probably get bitten. My worst nightmare is that someone will mistakenly believe that, by following the procedures mentioned on those pages, their snake worries are forever behind them. That’s one of the reasons those pages are peppered with so many cautions against such thinking. Thankfully, Dana was not so foolish. She’d read those cautions and had heeded them. When she opened her front door, she first looked to see if anything was on the porch before stepping out. 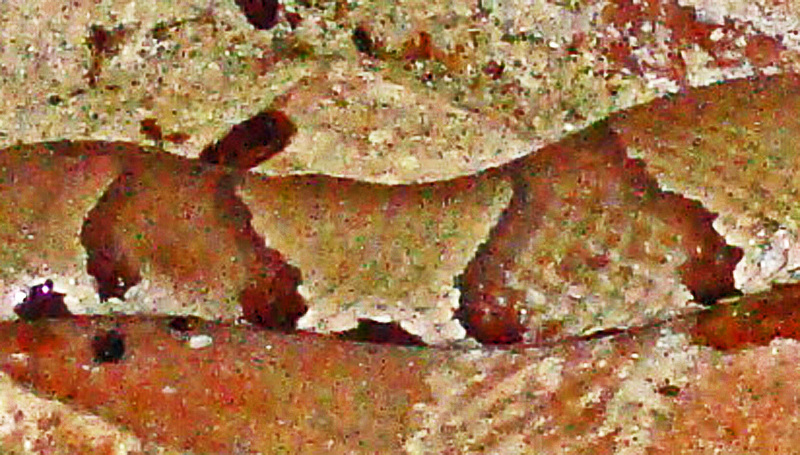 But notice this: the copperhead on her porch blended in well with the reddish coloration of the brickwork, and it wasn’t easy to see. Dana is a good observer, though, and she saw it right away. Good for her. Had she stepped on this snake, it would surely have bitten her. And although it was only about 24 inches long, she had a 50/50 chance that its bite would have landed her in the hospital, with a very sore ankle and leg, facing a lengthy recuperation and enormous medical bills. And, of course, she had less than a 0.02% chance that the bite would have been fatal (no fatal copperhead bites have been recorded in the U.S. since the early 1980’s). The various species of copperhead snakes found in the U.S. and Canada cause about 25% of the reported venomous snake bites (75% are rattlesnakes, with coral snakes and cottonmouths representing less than 1% each). 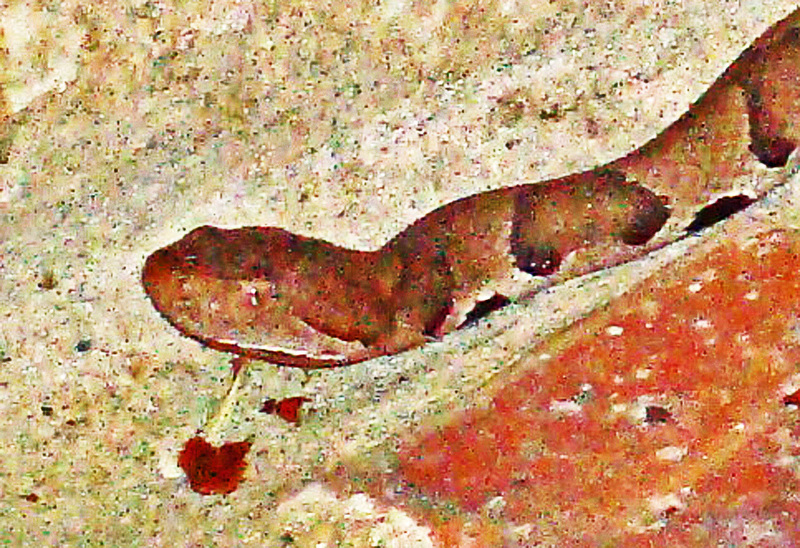 According to statistics compiled by the Texas Department of State Health Services, about 7,000 people are bitten by venomous snakes each year in the U.S.
Fortunately, only 1 out of 500 (0.02%) of these bites is fatal, and roughly half of the time the bite is dry–that is, the snake does not inject venom when it bites (either because its venom lumens are empty, or because it intentionally chooses not to inject venom with the bite). The moment I learned about the copperhead on Dana’s front porch, I made arrangements to physically visit her home, in Allen, Texas. Together, we looked over her yard to see exactly what extraordinary conditions existed there that encouraged so many snakes. The first thing I noticed was a small snake (unidentified, as only a portion of it was glimpsed for a second or so) in the landscaping near her front door. That landscaping was so thick that it was impossible to find the snake once it disappeared in the vegetation, without damaging the botanicals in the process. Dana studied it for a moment, then said “Well, Jerry, I guess the first order of business is to do something to thin out my personal botanical garden.” Enough said. No, maybe not enough said. The fact is, whenever the landscaping around your home is so thick and lush that it provides excellent habitat for rodents and their look-alikes (rabbits, raccoons, opossums, and so on), it will generally become home for some if not all of those animals at one time or another. And when that happens, look out. Snakes are a’comin! You can count on it. That’s what snakes do: cohabit locales with rodents and their look-alikes. Now, you might not think of opossums and raccoons as rodent look-alikes, and if you have trouble with that I understand. You forget, obviously, that litters of both those animals look quite rodent-like, and it’s the babies that attract the snakes. We also found rabbit holes in several locations, all surrounded by thick botanicals, in Dana’s yard. One of these had copious amounts of rabbit fur around the entrance, where a rabbit had recently been killed and devoured, most likely by a snake. Where rabbits breed, mice and rats also will be found. Baiting regularly for rodents, and filling in rabbit holes with gravel and rocks, are important adjuncts to any snake exclusion program, particularly while lush vegetation remains an important part of the picture. That’s fine for the short term, but let’s face it, the long term is what really counts. And constantly baiting lush vegetation with even small amounts of rodent bait is a recipe for–well–disasters of all kinds. Some baits are relatively safe, but others are not so safe. Some day you may unwittingly pick a bait in the latter camp, and if you don’t use tamper-resistent bait stations (which aren’t really as tamper-resistant as they claim, and in any case produce high-humidity environments and have other characteristics that make them way less than ideal under even the best of circumstances) your or your neighbor’s dog or cat will get a belly full of something that it should not have eaten, with predictable and–sigh–very unhappy results. Early in the spring of 2010, I supplied her with another batch of essential-plant-oil granular habitat modifier, so she could keep that part of the program going. An inspection of her yard revealed that the landscaping was now thin enough to prevent harboring snakes and rodents in most places. She plans to thin out the vegetation where it is now a bit too thick. Several rabbit holes were also found, which Dana plans to have filled with gravel. We baited the yard again with rodent bait, and will continue monitoring things. Hopefully, she won’t see any snakes in 2010, but–of course–Mother Nature is, if anything, unpredictable. I saw a snake that looked exactly like this in my small koi pond. Is it possible that it could have been a copperhead? I live in Elmore City in rural Oklahoma. There are a lot of rattle snakes living in my area – and I was surprised to see this one. Editor’s Note: Though Elmore City is on the western edge of the range for this species, it is possible you saw a copperhead. However, it is also likely you saw a harmless water snake, as some of the serpents in the genus Nerodia have markings vaguely similar to these. A good photo is hard to beat when trying to identify a snake after the fact. Keep your digital camera handy. I wear mine in a small pouch on my belt and take it everywhere I go just for that reason. Editor’s Note: Deb sent me several photos of this snake, after it got caught in some netting and died trying to get itself loose. The snake was a Texas rat snake (Elaphe obsoleta lindheimeri), one of our most beneficial snakes due to its predation on rats and mice.